Pitt Business students are able to complement their major with a certificate. Where the major demonstrates a student’s mastery of skill and knowledge in the discipline, the certificate adds another area of expertise that increases their marketability to employers. The Certificate Program in Business Analytics is designed to give students a strong foundation in the theory, processes, and tools of business analytics in the organizational setting. 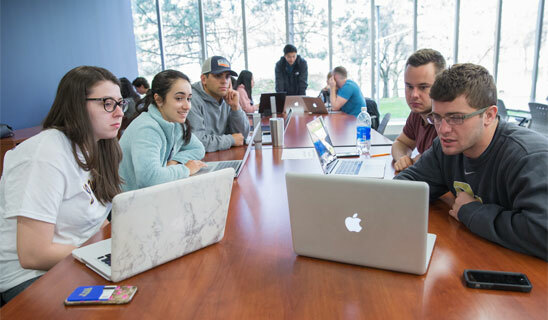 The CPBA will help students to understand both the statistical and managerial sides of business analytics so that students can add value to organizations of all sizes and types. This certificate offers a special opportunity to Pitt Business students with a strong interest in the global business. Students pursuing the CPIB will be particularly attractive to employers who value students with international interests, perspective, knowledge, and experience. This certificate is the major intellectual and curricular initiative of the David Berg Center for Ethics and Leadership. Students gain hands-on experience in issues of ethics and leadership, both as they relate to businesses and nonprofit organizations, by completing projects inside the classroom and for external clients. The Certificate Program in Sports Management prepares students for a career in a sports or sports-related industry. Through the CPSM, students learn about the business practices, processes, and tools of effective management in the sports industry, and they also complete an experiential learning component. The Undergraduate Certificate in Supply Chain Management (CSCM) teaches Pitt Business students the important concepts in supply chain management that are necessary to help companies build a competitive infrastructure and create net value. Additionally, students develop managerial skills highly valued in the corporate environment. Pitt Business students can also complement their business major with minors and certificates outside of the College of Business Administration. View the full range of options.